In a comics industry dominated by superheroes, it can be tough to find an alternative to capes and powers. 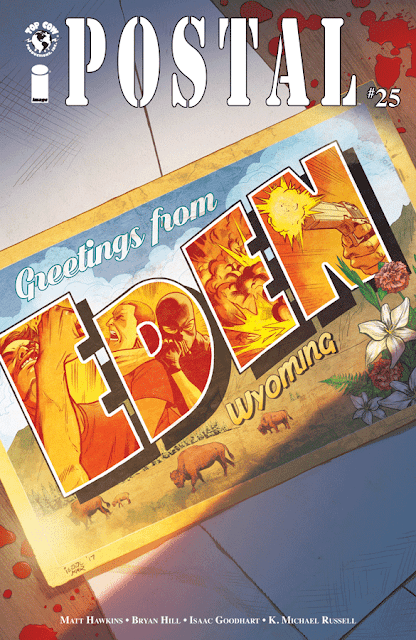 In 2015, Top Cow's Matt Hawkins along with Bryan Edward Hill and Isaac Goodhart launched 'Postal,' a crime drama series that was set in the fictional town of Eden, Wyoming where criminals could disappear from society under the protection of corrupt government officials and ruled by one family. Twenty-five issues later the series comes to an end in an explosive and mysterious fashion. Fans wouldn't have it any other way. Three years ago we were introduced to the Shiffron family. Laura the mother was the mayor, her son Mark ran the post office, and Isaac was the founder but absent and more myth than man early on in the series. Laura was a hardliner in keeping the peace in Eden to ensure it would remain under the radar. It helped to have an FBI director on your side to make it almost certain the town would remain off the grid. Mark has Asperger's Disorder, a rarity for a lead character in comics, which affects his ability to socialize and communicate. Instead of it being a liability, Mark's mental acuity and logical emotionless decision making was an asset in more ways than one. In fact, Mark has been the glue to keep the town intact all along. In this series finale, we learn the heavy burden that's been weighing on Laura all this time. The reveal is shocking and heart wrenching but we see just how many directions Laura's been pulled as the gatekeeper of Eden. In the beginning, Laura could be a heartless jerk towards Mark, degrading him and treating him like a child. In hindsight, she may have been protecting him, toughing him up for the battles to come. Between vetting newcomers, keeping the peace, looking out for Isaac's revenge, protecting Mark, and colluding with corrupt FBI officials, Laura also paid a giant price for the town's anonymity. She's done her share of crimes to keep control away from the feds, from criminals, from skinheads, and she wonders if it all worth it in the end. Hawkins and Hill were able to maintain a dramatic and compelling narrative throughout its run. Each arc seemed to introduce a new threat to Eden and Laura's authority. The writers would find a way to use Laura's ruthlessness and Mark's ingenuity to push back these outside forces. The path to this issue is paved with plenty of dead bodies. And through it all Isaac Goodhart brought it all to life. Seeing Goodhart's evolution as an artist on a single comic was a treat to behold. You could see the growth in confidence, in precision, in risk-taking that he took to make each issue into a dynamic rural-noir. In this conclusion the focus is squarely on Laura and her progression throughout the issue, from reminiscing about the past, to confessing her sins, to her final decision, tortures her to her core and Goodhart conveys all those emotions in her face. K. Michael Russell shines with colors that turn day to night with vibrant yellows and oranges then moody blues and rich reds. The art is consistently solid. 'Postal' ends an impressive run of crime, corruption, and violence with a shocking but ambiguous conclusion. The fortunes of Mark, Maggie, and Laura come to a crossroads realizing it's all led up to this. With this extended final issue, 'Postal' shows why comics don't have to be about superheroes to be compelling and exciting.